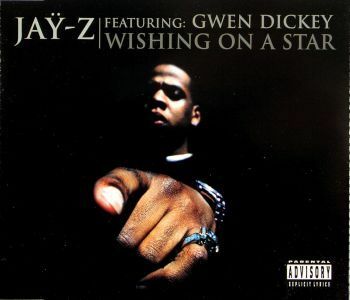 "Wishing on a Star" is a 1998 single by rapper Jay-Z that can be found on the United Kingdom release of In My Lifetime, Vol. 1. It features vocals from Rose Royce's Gwen Dickey, who sings the chorus of Rose Royce's "Wishing on a Star" for this song's chorus. The track is produced by the Trackmasters, who also produced a remix of this track. A producer named D'Influence also remixed it: this version is on two of Jay-Z's greatest hits albums, Chapter One: Greatest Hits and Bring It On: The Best of Jay-Z. The original version is found on Greatest Hits. 1. "Wishing on a Star (Radio Edit)"
2. "Wishing on a Star (Trackmasters Remix)"
3. "Wishing on a Star (D Influence Remix)"
5. "Wishing on a Star (Trackmasters Acappella)"